We believe that warm, loving relationships are essential for growth and learning! Our experienced, nurturing early childhood professionals will give your infant one-to-one attention along with many hugs and smiles! In addition, we will be responsive to your baby’s individual needs. We know that each infant has his own schedule for eating, sleeping and playing! We also know that your infant is learning all the time. Our infant teachers will talk and sing with your baby, encourage your baby to explore and play in his environment, and even plan daily learning activities – specifically for your child! New Pathways’ Infant Program is located on the DePauw University campus where we are able to offer care in the intimate, family atmosphere of our licensed child care home. A family atmosphere is important – because families are partners at New Pathways! Parents are always welcome to visit their infant during the day. Our caregivers stay in close contact with families. 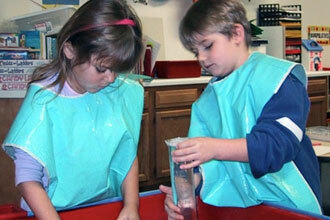 Each day, we will provide you with a written report of your child’s activities. 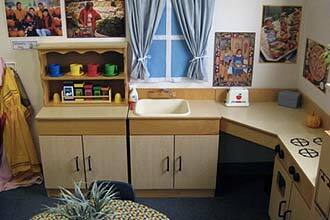 Our infant rooms are bright, clean, and inviting with age-appropriate toys and books available on low, open shelves. Each infant has his own crib and a cubbie for personal belongings. Babies love to be outside! Your infant will enjoy a fenced outside play area and stroller rides around the DePauw University campus. We would love to share the exciting adventures that await your child each day. Come visit our Infant Program.